Lands’ End is a mesmerizing wonder where the allure of nature can overwhelm us with its charm. Present near Nainital, in the state of Uttarakhand, this is a spot frequented by nature fanatics who want to get away from the bustle of daily life. With an amazing view of the land which surrounds it and the mountains which tower over the spot, the location has got its name because it seems like we’ve reached the end point of the towering top. As it is the perfect spot for people looking for some adventure, the best way to enjoy would be to walk till the top and enjoy the great view of the forest which lies along the way. Reaching the pinnacle by riding on horses is another way to enjoy the lush greenery which spreads as far as the eye can see. The breathtaking view of the Khurpa Lake from the top is another reason tourists flock to the region. The topmost point does not have any kind of boundary and hence, do be careful at the spot. Wear comfortable shoes if you are walking up to the top of the hillside. The horse ride can take an hour and can tire you due to the continuous jolting. Take a horse ride up to the top of Lands’ End for a different experience. Enjoy a soul-stirring view from the top, of the green valleys and snowy mountains which loom large at a distance. Trek on the pathway from the bottom to reach the spot while viewing the mesmerizing beauty which lies along the way. This is a perfect spot for photography as the vivid backdrop can complement and result in some of the best shots. Enjoy drinking tea and eating food in the beautiful and soothing atmosphere. Go out boating at the serene Naini Lake with its calming waters. Shop around at the local bazaar to get a good collection of the local artifacts and handmade products. Trek up to Tiffin’s Top which offers another great perspective on the surrounding panoramic view. 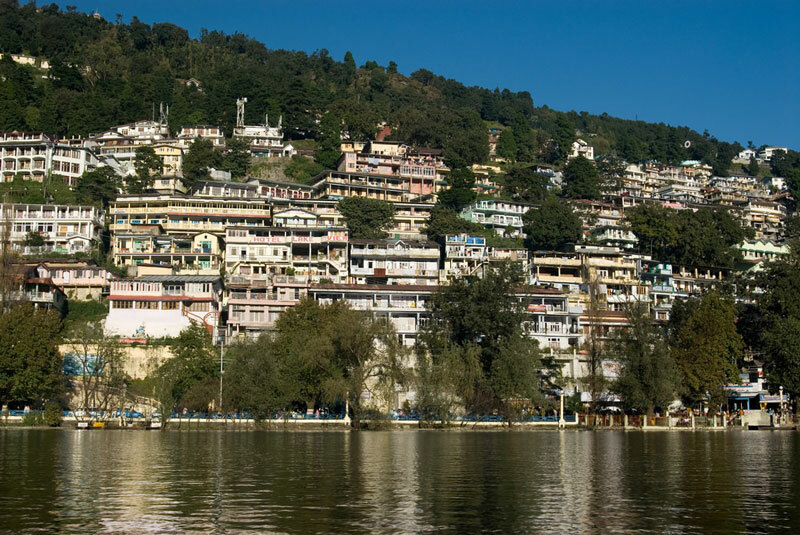 Nainital is basically a spot which can be experienced all year around. The summer months of April to October are the best to visit Nainital and escape the heat which beats down the rest of the country. The winter gets too chilly and the monsoon can experience heavy rainfall at times which can lead to slushy pathways and restricted field of vision. Lands’ End is just at a distance of about 3 kilometers from the center of Nainital. The foothills can be reached by cabs, buses and auto rickshaws. The top can be reached by trekking, horse riding or by cars. The nearest airport to Nainital is the Pantnagar Airport while the closest railway station is the Kathgodam Railway Junction which is quite nearby at about 35 kilometers making it very accessible. The name of the famous spot comes from the fact that the drop is so vertical that it seems like we’ve reached the end of land. It is present at an altitude of about 2200 meters above sea level. It has only one pathway to enter and exit. The view covers the breathtaking Khurpa Tal and also the dainty terrace agriculture which is practiced around here. Riding to the peak spot on horses is a famous activity which is carried out here. With a fresh aura which can take mesmerize anyone, Lands’ End is indeed a perfect spot to experience the majestic touch of nature and to get closer to it. A sense of adventure blended with awe inspiring atmosphere and relaxing climate is what the location gives us. All this makes Lands’ End the perfect spot for people who love photography, nature and adventure to flock to and experience a great time.